Division of Fine Arts to Present "All the Way Home"
Truman’s sixth annual University Conference will take place from 8 a.m.-4 p.m., Feb. 15. "Celebrating the Truman Vision: Focusing on the Future" is the theme for the day. The Conference is an opportunity for the entire University community, faculty, staff and students, to review and collectively address key issues affecting the future of the University and its ability to provide students with the best possible opportunities to learn and develop their talents both inside and outside the classroom. This year’s Conference objective is to solicit discussion and input from all areas of the University community relating to the future of Truman through the development of the University’s new strategic plan. There will be no classes from 7:30 a.m.-5:30 p.m., Feb. 15. Registration will begin at 8 a.m. in the lobby outside Baldwin Auditorium, followed by a welcome and introductory remarks from University President Barbara Dixon at 8:30 a.m. in the Baldwin Auditorium. Following this, Stephen Briggs, the provost of the College of New Jersey, will give the plenary address, "To Be Who We Say We Are," at 8:45 a.m. Briggs led an academic renewal at his institution. The first of the day’s three sessions of concurrent meetings will begin at 10 a.m. Students, faculty and staff can participate in a variety of presentations and discussions, including an additional presentation from this year’s Baldwin Lecturer, Craig E. Nelson, titled "Balancing Nature and Rigor" at 10 a.m. See http://vpaa.truman.edu/communications/universityconference/2006/index.stm for a complete listing of the session topics, locations and facilitators. A buffet lunch is scheduled at noon in the Student Union Building Georgian Room. A reservation is required for the luncheon. The annual Baldwin Lecture will be delivered after lunch by Craig E. Nelson, a National Carnegie Scholar for Teaching and Learning and professor emeritus of biology at Indiana University in Bloomington. His presentation, "Maps for Understanding Liberal Education," will begin at 12:45 p.m. in the Student Union Building Georgian Room. All Conference participants are invited to the Technology Fair in the afternoon on the day of the Conference. See Page 3 for more information about items on display at the Technology Fair, which will take place from 2-4 p.m., in the Student Union Building Activities Room. The third and final concurrent session will begin at 2 p.m. following the Baldwin Lecture. Finally, the Conference will conclude at 3:15 p.m. in the Student Union Building Activities Room, with a chance for faculty, staff and students to socialize and reflect on the day’s activities. Renée M. Wachter has been selected for appointment as the dean of the Business and Accountancy Division at Truman State University. She begins her duties July 1, 2006. Wachter comes to Truman from Montana State University where she serves as associate dean for academic affairs in the College of Business and founding director of The Bracken Center for Excellence in Undergraduate Business Education. She currently plays many prominent roles, including leading an initiative to expand opportunities for internships and business professionalization for students, promoting the enhancement of faculty development initiatives which facilitate excellence in pedagogy, and encouraging the provision of resources for the maintenance of a contemporary curriculum. She provides oversight and administration for academic programs, paying specific attention to continuous improvement in teaching, learning and scholarship. Wachter also coordinates activities as the college works toward reaffirmation in 2007 of its basic accreditation with AACSB-International and initial separate accreditation of the accountancy program. Wachter earned a Bachelor of Science in Business from the University of Kansas. She majored in marketing and took concentration work in mathematics. She went on to earn a doctorate in business from Indiana University with major emphasis in management information systems and additional studies in marketing and statistics. While at Indiana University, she was the director of the Groupware Computer Lab: Collaborative Work Laboratory, Planning and Policy Studies Program, in which she facilitated sessions in strategic planning, conflict resolution and brainstorming with profit and non-profit organizations and served as the liaison to business entities. Subsequently, Wachter served as a faculty member and director of the Information Systems Option in the undergraduate business and Master of Business Administration programs at Ball State University. She taught management courses in the traditional classroom setting as well as a satellite-based distance-learning format. She exercised leadership in the Department of Management by working toward reaffirming the accreditation of the College of Business from AACSB-International. Wachter received an appointment to the position of associate dean of the School of Business and director of the Office of Graduate Business Programs at the University of Indianapolis where she functioned in several lead capacities at the school and university levels. Under her aegis, curricula for several master’s degree programs underwent restructuring and achieved accreditation under the Baldridge Quality Standard. She also organized the institution of specialized certificate programs for business professionals, custom on-site Master of Business Administration programs for major corporations, a college credit course in finance and international business for gifted high school students, and served as the acting dean for a semester during a sabbatical leave of the dean. Wachter has published in a number of refereed domestic and international scholarly journals and proceedings concerned with computer-mediated communication, learning and knowledge management. She is active in issues of educational assessment, schooled in Baldridge Award Self-Assessment Training for Education with the American Society for Quality (ASQ) and in the Academic Quality Improvement Project (AQIP) of The Higher Learning Commission of the North Central Association. The Teaching/Learning Technology Roundtable will sponsor the Fourth Annual Technology Fair on the afternoon of the University Conference. All members of the Truman community are invited to the Tech Fair, which will take place from 2-4 p.m., Feb. 15, in the Student Union Building Activities Room. The purpose of the event is to provide insight on ways of integrating technology into the teaching and learning process. Submissions to the TruTech Challenge will be on display at the Fair along with some of the newest technology-based resources available from Pickler Memorial Library. This year, the latter portion of the TruTech Fair will be held in conjunction with the University Conference’s social hour, during which refreshments will be served. The two grand prize Dell PDAs will also be awarded to the winners of the TruTech Challenge in a ceremony at about 3 p.m. Contact Chad Mohler at chmohler@truman.edu for more information on the Fair. All faculty and staff will receive information this week about supporting the Truman State University Foundation through the 2006 Faculty and Staff Campaign. The campaign is led by Kay Anderson, registrar, and Scott Ellis, dean of science. The theme for this year’s campaign, "Building Truman," was chosen to illustrate how private gifts are being used to strengthen the foundation of the University. We continue to build opportunities through academic scholarships, study abroad, faculty development and research, additional support for each of the academic divisions and cultural programs like the Kohlenberg Lyceum Series. The campaign push has been running since Feb. 2 and will continue through March 15. However, all gifts from July 1, 2005, through June 30, 2006, will be counted toward the campaign. The University Art Gallery at Truman State University presents "Encounters with Lincoln," an exhibit of illustrations by Thomas J. Trimborn, professor of music, for a new book from Truman State University Press. The show opens with a public reception at 6 p.m., Feb. 16, in the University Art Gallery. The reception will be followed by an artist-led discussion at 6:15 p.m. and book signing. The show will be open until March 2. "Encounters with Lincoln" brings together Trimborn’s lifelong interests in President Lincoln and in illustration. As a child, Trimborn was drawn to study Lincoln simply by the character of his face. "Encounters with Lincoln: Images and Words" is the title of a new book from the Truman State University Press in which Trimborn chronicles Lincoln’s life in pictures and text, including important contemporaries of Lincoln’s such as Frederick Douglass and Stephen Douglas, as well as some who have carried forward the contribution he made toward the emancipation of African Americans, including Mahalia Jackson and Martin Luther King Jr. Finally, these works comment on the implications of Lincoln’s life and words for the ongoing struggle toward liberty and opportunity for all people. Thus, the display of images of Lincoln and various participants in the civil rights struggle coincides well with President’s Day (Feb. 20) and Black History Month (February). The University Art Gallery at Truman is located on the ground floor of Ophelia Parrish. Gallery events, talks and most other events are free and open to the public. Gallery hours are Monday-Thursday from 8:30 a.m.-7 p.m., Friday from 8:30 a.m.-5 p.m., and Saturday from noon-4:30 p.m. For more information, contact the Gallery Director, Aaron Fine, at 785.5386 or afine@truman.edu. Beta Alpha Psi will again provide free electronic tax filing to all students and members of the Kirksville community this year. International students are welcome to file as well. Filing will be available from 8 a.m-3 p.m., Feb. 18, Feb. 25 and March 4, in Violette Hall 1424. The site operates on a first come, first serve basis. Beta Alpha Psi is a national scholastic and professional organization for financial information professionals. For more information, visit http://bap.truman.edu. Thirty-eight pre-collegiate piano players will perform at the 23rd Annual Piano Festival Feb. 17-18. The pianists will be auditioning for cash prizes and scholarships including the full-ride Truman Piano Fellowship Award. They have been invited to the final round of competition by piano faculty after submitting a recorded performance of their repertoire. Sponsored by the Division of Fine Arts, their performances are open to the public free of charge. The final round of this competition will begin at 8:30 a.m., Feb. 18, in the Baldwin Auditorium and at 9:30 a.m., in the Ophelia Parrish Performance Hall. Registration will be located in the Ophelia Parrish lobby area. Guest artist Alan Huckleberry from the University of Iowa will also perform at the festival. Huckleberry is a graduate of the conservatories in Karlsruhe and Cologne, Germany and holds a Master of Music and Doctor of Musical Arts from the University of Michigan. He will present a solo recital at 8 p.m., Feb. 17, in the Ophelia Parrish Performance Hall, that features piano music written during the past 100 years. Additionally, Huckleberry will conduct a master class with two Truman piano majors at 3:30 p.m., Feb. 18, in the same location. All are welcome to attend his recital and workshop. For more information about the Piano Festival, contact David McKamie at 785.4405 or e-mail dmckamie@truman.edu. 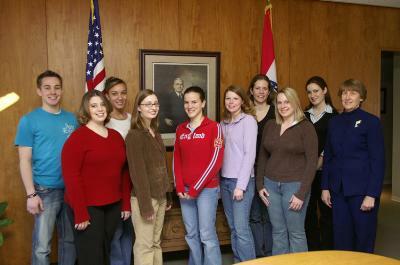 Students who received the Foundation Study Abroad scholarships include (pictured front row, left to right) Lindsey Barkho, Jennifer Piel, Margaret Abbott, Lisa M. Field and Christine Wilson with University President Barbara Dixon (back row, left to right) Chris Copley, Christine Motte, Ashley Walker and Shannon Kelly-Salo. Chrystal Detweiler is not pictured. The Truman State University Foundation awards 10 $1,500 scholarships annually to students who are participating in a summer, faculty-led study abroad experience. The students pictured have been selected as recipients in 2006 and will study abroad in various programs, including Braveheart Meets King Arthur, Europe in Transition, Costa Rica, The Natural History of Belize, Transcultural Nursing Experience in the Philippines and Salamanca, Spain summer study abroad programs. Applications for the majority of the Foundation scholarships are due by midnight, Feb. 17 and are available at http://www.truman.edu by clicking on Current Students, Foundation Scholarships. For more information or questions, contact the Office of Advancement at 785.4133. Truman’s Model United Nations Team is seeking students interested in world politics, a fulfilling extracurricular activity and course credits to join the organization. Model United Nations focuses on the hottest current issues arising within the international system. Students from institutions from coast to coast come together to act as delegates of the countries of the world in simulating the debates, negotiations, court cases, crisis management and other activities carried out by the United Nations. This year, the Model U.N. lottery picked Team Truman to act out the role of the United States of America. This is a tremendous chance for Truman’s squad, since the U.S. delegation must actively participate in virtually every aspect of simulation. Although Truman’s team has already garnered far more than its share of "Best Delegation" recognitions during the past 30 years, all eyes will be on this year’s team to see if it can fulfill its new obligation successfully. In order to meet its obligations, Truman’s team needs many more student participants. Training sessions will be from 8-10 p.m., every Tuesday, beginning March 7, in Baldwin Hall 348. Model United Nations, POL 554, Section 2, is a two-semester class (spring and fall) that earns students a total of three credit hours. The class will be largely student-taught. The spring sessions of the course prepare students for the Conference. Participants will gain important information regarding the United Nations and American Model United Nations (AMUN), be grounded in the discussion/debate format, and be exposed to a broad range of relevant U.S. policies and positions. The fall session will continue the process and increase the intensity. Writing and defending resolutions regarding the issues will be part of the challenge. The AMUN Conference will take place in Chicago from Nov. 18-21. The University will pay for the students’ rooms, travel and delegation expenses. Students must pay for their own food. Students interested in participating or obtaining more information should contact Amanda Keener at akeener@gmail.com or Stuart Vorkink, professor of political science, at ss27@truman.edu. Truman State University’s Division of Fine Arts will present "All the Way Home" directed by Lee Orchard, professor of theatre at Truman. The show will be at 7 p.m., Feb. 20-25, in the Ophelia Parrish Courtyard Theatre. Several children from the Kirksville community will also be in this production. Tickets are $2 each and may now be reserved or purchased in advance at the Ophelia Parrish Box Office. Opening night tickets are free. The Ophelia Parrish Box Office is open from 10 a.m.-4 p.m., Monday-Friday. For more information about tickets, call 785.4515. Contact Orchard at 785.4267 for more information about the production. 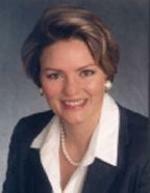 The Division of Business and Accountancy will present Laura Patterson of VisionEdge Marketing, Inc. as the 2006 Bentele/Mallinckrodt Executive-in-Residence Feb. 21-22. Patterson will lecture on "Customer Centricity: The Road to Success" at 6:30 p.m., Feb. 21, in Violette Hall 1000. "Strategically Marketing Services to Build Value and Beat the Competition" is the topic for her presentation at 3:30 p.m., Feb. 22, in Violette Hall 1000. Both talks are open to all students and faculty. Patterson is the president and co-founder of VisionEdge Marketing, Inc., a metrics-based marketing firm that specializes in helping organizations create a competitive advantage designed to attract, secure and retain profitable customers. The company’s services include business intelligence, product and strategic marketing, pipeline re-engineering and revenue creation and professional development. Before VisionEdge Marketing, Patterson worked at Alex Sheshunoff Management Services, and spent 14 years at Motorola, Inc., where her customer acquisition programs helped propel the microcontroller division to number one in market share. In addition, she championed and implemented the idea for the world-wide brand building and customer advocacy initiative "Powered by Motorola." Patterson has authored the books "Gone Fishin’" and "Measure What Matters" as well as several marketing and branding articles. She has served on non-profit boards and as guest lecturer at various universities including the University of Texas at Austin, Stanford University and Purdue University. This semester’s Executive-in-Residence is an alumna of Truman State University. Patterson was a Pershing Scholar at Truman. The Bentele/Mallinckrodt Executive-in-Residence Program was established to bring outstanding members of the business community to meet with students on the Truman campus. The visiting executive meets with business students and faculty in formal and informal group sessions during the two-day campus visit. In addition, opportunities are given to members of the entire University to attend sessions on a topic or issue of interest to the broader University community. "Celebrating the Truman Vision: Focusing on the Future"
For more information, contact Julie Lochbaum in the Center for Teaching and Learning at 785.4391. As part of the review of the Liberal Studies Program being conducted by the Undergraduate Council, a committee of faculty and students is reviewing the Essential Skills: Writing as Critical Thinking portion of the Liberal Studies Program. They would like feedback from faculty, staff and students on whether the course is meeting the intended outcomes. To provide feedback and review the outcomes, please go to http://survey.truman.edu/takeSurvey.asp?surveyID=253. The survey, titled "Essential Skills—Writing: General Feedback Form," is also available at http://survey.truman.edu. An upgrade to the Banner system is scheduled to begin at 5 p.m., Feb. 17, and will continue until Feb. 20. Administrative users as well as self-service (Web) users, including staff, students and faculty, will not have access to Banner during the upgrade period. The deadline for completed applications has been extended to 4 p.m., Feb. 22, in the CSI Office. Tickets are $8 with a Truman ID, $15 for general admission. Contact the SAB Office at 785.4722 for more information. Applications can be picked up in the Office of Admission, McClain Hall 205. Completed applications must be returned to the Office of Admission by 5 p.m., Feb. 20. Interviews will be conducted Feb. 22-24 and Feb. 27. Contact Jill Graves at 785.4114 or jgraves@truman.edu for more information. Start thinking about possible topics, presentations and creating art for the Environmental Studies Conference and the ARTSEnvironmental Gallery Show. Papers and presentations from all disciplines and backgrounds will be accepted. To submit a proposal, e-mail a concise abstract to cassiephillips@care2.com. Proposals will be accepted through April 1. Conference and Art Show submissions are opened for students, faculty and Kirksville community members. Paralympic rugby athlete from the film "Murderball"
"The Career Expo Doctor is In"
David Kiblinger, a sophomore physics and mathematics double major from Cape Girardeau, Mo., presented "Construction of an Aurora Detector" at the 2006 Winter Meeting of the American Association of Physics Teachers recently held in Anchorage, Alaska. Kiblinger’s presentation was sponsored by his research mentor, Michael Goggin, associate professor of physics, who also attended the meeting. The work described was the result of Kiblinger’s summer 2005 research project funded by the National Science Foundation through Truman’s NextSTEP Program. Julie Wynn, a junior psychology and pre-elementary education double major from Shrewsbury, Mo., has been named the 2005 "Volunteer of the Year" for Special Olympics Missouri. Wynn received her award during the annual "Night of Inspirational Stars" Awards Banquet that took place on Jan. 21 at Tan-Tar-A Resort in Osage Beach, Mo. Each year, Special Olympics Missouri utilizes more than 47,000 volunteers. Wynn’s involvement with Special Olympics Missouri began when she volunteered with the organization during her high school years in St. Louis. Her work grew into a leadership role when she came to Truman and joined the Games Management Team for Area Spring Games, first serving as Olympic Town Chair. Her ideas during that year led to a larger Olympic Town than had ever been held. Wynn continued working within the organization, adding Opening Ceremonies to her duties, and in 2006 she was chosen to chair the entire Games Management Team. When a local bowling team needed a coach, she stepped in as well. Windfall, the campus literary magazine, is now accepting student-produced submissions of art, photography, music, poetry, prose, drama and essays. Submissions may be turned into their office in KM 203B, their CSI mailbox or e-mailed to windfall@truman.edu. Submissions are due Feb. 14. See their Web site, http://windfall.truman.edu for more details. University Counseling Services is sponsoring Healthy Relationship Awareness Day on Feb. 14 with a table in the Student Union Building from 10 a.m.-2 p.m. Information and questionnaires to see how healthy your relationships are and find out ways to improve them will be provided. Contact Erika Sterup at 785.4014 or esterup@truman.edu for more information. Human Resources, in cooperation with the staff of the Student Health Center, announce the 2006 annual wellness screenings. They will be offering blood pressure, cholesterol, glucose and prostate screenings for faculty, staff and spouses at the Student Health Center. This service is provided free to all who are covered by the University’s health insurance plan. Other faculty, staff and spouses are welcome to participate for a minimal cost. To attend, you must register for a specific appointment block from 7:30-8 a.m., 8-8:30 a.m., or 8:30-9 a.m., Feb. 14, Feb. 15, Feb. 21, Feb. 23 or March 3. No walk-ins will be accepted. To R.S.V.P. for a block, visit http://hr.truman.edu/register/. Questions concerning the screening should be addressed to the nursing staff, Student Health Center at 785.4182 or Human Resources at 785.4031. The Anthropology Club will be selling homemade chocolate and candy from 10 a.m.-1:30 p.m., Feb. 14, in McClain Hall. Contact Ashley Wagoner at 785.7177 or arw334@truman.edu for more information. The Center for Teaching and Learning Weekly Lunch Series Extra Edition features the Wakonese Reading Circle and Ken Bain’s "What the Best College Teachers Do," from 12:30-1:30 p.m., Feb. 14, Feb. 21, and Feb. 28, in Pickler Memorial Library 205. These sessions will be facilitated by Gregg Siewert, Karen Smith and Teak Nelson. Contact Linda Davenport at 785.4391 or lindadav@truman.edu for more information. The Mostly Live Composers Society will be presenting its student composers recital at 3:30 p.m., Feb. 14, in the OP Performance Hall. For more details, contact Joshua Baum at jab708@gmail.com. The Association of Black Collegians will sponsor a Valentine’s Day Dance from 7-11 p.m., Feb. 14, in the SUB Down Under. The cost is $2 per person and $3 per couple. Contact Deanna Love at 773.704.7753 or dml124@truman.edu for more information. Cardinal Key invites all females of sophomore or junior standing (at least 60 Truman credit hours) with a Truman GPA of at least 3.25 to attend their "Make a Difference Tomorrow by Serving Today" Rush events: last names A-M from 7-8:15 p.m. and N-Z from 8:30-9:45 p.m., Feb. 16; and 6-7:30 p.m, Feb. 19. All events are in the SUB Activities Room. For more details, visit http://cardinalkey.truman.edu. Upward Bound employment applications are due Feb. 17. Ekklesia Campus Ministry will co-sponsor a lecture titled "The Scientific Accuracy of Intelligent Design" to be given by Brad Harrub of Apologetics Press at 7 p.m., Feb. 17, in VH 1000. E-mail bpoyner@truman.edu for more information. Residence Life will present Salsa Extravaganza from 8-11 p.m., Feb. 17, in the SUB Down Under. Everyone is invited to this salsa dancing event prepared by student advisers of different residence halls. Lessons for beginners will be from 8-9 p.m., and open dancing will be from 9-11 p.m. For further details, contact Rafael Andrade at 785.5187 or ja335@truman.edu. The Board of Governors will meet at 8:30 a.m., Feb. 18, in the SUB Conference Room. The American Marketing Association is sponsoring Hoops 4 Hospice, a 3 on 3 basketball tournament, from 11 a.m.-5 p.m., Feb. 18, at the Student Recreation Center. All are welcome to register, and trophies will be awarded to the champions. The cost is $15 per team, and each team can have up to five players. There will be male and female brackets, and participants can also pay $1 to enter a free throw contest. For registration information, contact Ben Hicks at bjh448@truman.edu. Campus Christian Fellowship presents Lecrae’s "Real Talk" concert tour at 7 p.m., Feb. 18, in Baldwin Auditorium. Tickets cost $5. Contact Bryce Marner at 314.276.7954 for more information. An Iowa-based company called National Financial Educators will present their program, "The Money Game," at 8 p.m., Feb. 20, in Baldwin Auditorium. The program, sponsored by Delta Sigma Pi and the Funds Allotment Council, is designed to teach financial literacy skills to college students. The program is highly interactive and accompanied by a workbook students fill out as they go along. Students will learn about automatic savings and investing plans, how to minimize student loans and credit cards and time management. The public is welcome to attend. For more information, visit http://www.nationalfinancialeducators.com or contact Adam Carroll, National Financial Educators co-founder, at 515.225.6518 or adam@nationalfinancialeducators.com. The Nursing Student Association will sponsor the Health Awareness Fair from noon-5 p.m., Feb. 23, in the multipurpose gym at the Student Recreation Center. The Fair will include a variety of booths offering health screenings and information, including skin fold testing, blood pressure screenings, hearing screenings, sexual and mental health information and more. Free door prizes will be given away. For more details, contact Lauren Merryfield at d2030@truman.edu. Ryan Huber, a junior music major from Belleville, Ill., will present a Junior Piano Recital at 8 p.m., Feb. 23, in the OP Performance Hall. The event is open to the public, and admission is free. The Observatory will be open to the public, weather permitting, from 8-10 p.m., Feb. 23, at the University Farm. Go to http://observatory. Andy Lee, a Truman alumnus who is currently a graduate student at the University of Missouri-Kansas City, will present a Visiting Artist Solo Piano Recital at 8 p.m., Feb. 24, in the OP Performance Hall. The event is open to the public, and admission is free. The Center for Student Involvement is sponsoring the Truman College Bowl Team to attend the Regional Tournament held on Feb. 24 and Feb. 25 at Kansas State University in Manhattan, Kan. For more information, contact Program Advisor Amy Currier at 785.4222 or acurrier@truman.edu. The African Students Association will present Sights and Sounds of Africa at 4:30 p.m., Feb. 26, in the SUB Activities Room. This will be an opportunity to experience African culture through food, dance, and much more. Contact Anu Orebiyi at aoo211@truman.edu for more information. Omicron Delta Kappa is now accepting nominations for the Student Hall of Fame. Nomination forms are available in each division office and in David Hoffman’s office, Kirk Building 112. Nominated students must have at least 90 credit hours and plan to graduate by December 2006. The deadline for nominations is March 2. The award will be presented at the Leadership Recognition Banquet on April 19. Contact Ilana Barash at 665.3130 or ikb513@truman.edu for more information. Beta Theta Pi and Alpha Sigma Alpha will sponsor the Spike Charity Volleyball Tournament from 11 a.m.-4:30 p.m., March 4, at the Student Recreation Center. Coed teams of at least six people, including at least three women, can register to participate for $5. Money raised will go to Hope’s Kitchen. See the fliers posted on campus for registration information. Submissions for the Schwengel-Lincoln Contest in essay, oratory and art are now being accepted. Contestants must use an informed understanding of former United States President Abraham Lincoln and of the selected excerpted passage from "Encounters with Lincoln," a book recently published by Thomas Trimborn, professor of music, to prepare a 1,000-1,500 word, 3-5 page essay, a speech of the same length or an artistic work. Winners in each division will receive a $300 cash prize or a trip to Washington, D.C. Essay and oratory submissions should be turned in to the Language and Literature Division Office, while submissions of art should be turned in to the Fine Arts Division Office. The deadline for submission is 5 p.m., March 6. Contact Chett Breed at 785.5981, Barry Poyner at 785.4063 or Russell Nelson at 785.7332 for more information.